The goal of energy conservation in the home moves closer to mainstream acceptance as green technology evolves. For many, the thirst is present but obstacles remain when it comes to cost and implementation. The challenges faced in the residential market also translate to the business world. Many businesses have gradually implemented energy-saving techniques, from lighting to HVAC. These businesses still face the very real challenges of applying wholesale changes across the facility – while remaining in budget. Several options exist for businesses seeking changes in how they use power facility-wide. Load shifting, for example, is a strategy that attempts to “shift” demand so that less power is used during expensive peak times. This concept is growing in popularity in the United States, particularly in the southwest where populations lean heavily on daytime air conditioning. Regardless of the region, all indications point to power getting more expensive. This is bound to bring further attention to energy-saving techniques such as load shifting across the nation, as well as internationally. Power costs are highest during peak times of the day — say 1-4pm — when energy usage is maxed out. The theory behind load shifting is to use more power when it’s cheap and less power when it’s expensive. The challenge is finding a load shifting solution that will keep fully occupied facilities comfortable as temperatures surpass 80, 90, or even 100 degrees. One solution is to run the air conditioners at maximum output through the morning and dial back during the peak afternoon hours — and deal with the tremendous downsides. It’s terribly inefficient, and creates an environment where everyone is cold in the morning and becomes gradually hotter through the afternoon. A better solution is to store cooling energy for use at a later time. Using thermal storage, businesses could create cooling energy at night or in the morning when temperatures are low and power is cheap, and store that cooling energy for use during the hotter peak demand periods. This would allow facilities to turn off air conditioning when rates are most expensive. The proof of concept for thermal storage — with a unique twist — exists today at my home near the Twin Cities. Minnesota summers are a far cry from the Mojave Desert, but the temperatures often exceed 90 degrees and occasionally break the 100-degree mark. Residential homes in this region rarely face demand-related charges, but such penalties are common in public and commercial facilities. This will become more widespread as power companies work to keep their peak loads at manageable levels — a growing concern as more power companies struggle to remain within the boundaries of their electrical distribution framework. 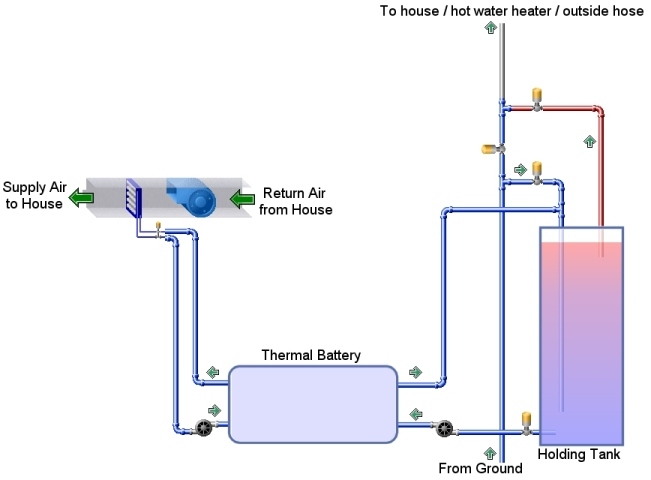 My concept uses the free cooling potential from my home's water supply to charge a thermal battery, which stores cooling energy that can be used on-demand to supplement and/or replace the cooling provided by the air conditioner. I decided to power the thermal battery with a phase change material (PCM) rather than water because water has a very low freezing point (32F), and other negative attributes that complicate the process. A fixed amount of liquid stores much more energy as it drops in temperature by one degree and transitions completely through a phase change from liquid to solid than it does when it is cooled by one degree in the liquid phase. If we use water as an example, it takes 144 times the amount of energy to cool a tank of water from 32F to 31F and turn it into a block of ice than it does to cool the same tank of water from 33F to 32F as a liquid. So if I could find a simple and efficient way to turn a tank of water into ice it would be able to store a very large amount of cooling energy that I could use to cool my home. However, this wasn't realistic because water has a freezing point of 32F under normal conditions, and I couldn't think of any free ways to cool a tank of water down to 32F in the summer when my home actually needs the cooling energy. The solution was to find a substance with a higher "freezing" point so that I could change it from liquid to solid phase using only the average temperature of my home's water supply as the cooling mechanism. By doing this I’d be able to take advantage of the additional energy storage capacities that exist when a substance changes phases from liquid to solid — and also store a large amount of energy in the thermal battery, at a temperature which would cool my home. I selected HTF Exotherm® technology to achieve this goal. HTF Exotherm is an unusual phase change material (PCM): exceptionally stable, non-caustic/toxic, and capable of storing and releasing large amounts of energy. It doesn’t have to be “encapsulated” to protect ancillary equipment and is capable of transitioning back and forth from solid to liquid a virtually unlimited number of times without degrading. Unlike water, HTF Exotherm doesn’t expand when it freezes, so the thermal battery could be made without engineering in the extra materials needed to handle the expansion. Plus, it is an FDA-registered material that can be recycled and safely disposed. The HTF Exotherm PCM can be formulated to target a specific transitional temperature where the material changes phase from liquid to solid. This means I could fill a thermal battery tank with a specific HTF formulation designed to freeze at 60F, and successfully "charge" the battery by using only the cooling energy available through the incoming household water supply. The system design is rather simple, comprising of an insulated holding tank, some piping, two small pumps, a collection of sensors and coils, and a couple of controllers, with a tank of specific temperature HTF Exotherm PCM at its core. My home system benefits from having a free source of cooling energy flowing through the house at all times, courtesy of the city water supply. The water enters the home at approximately 55F degrees, with slight fluctuations depending on the time of year. It resembles a natural geothermal loop, with underground pipes producing naturally cooled water. The water first enters the insulated holding tank and then proceeds to a 150-quart thermal battery tank containing the PCM. The water then circulates through a copper coil inside of the tank which enables heat transfer between the water and the PCM. The water flows through this tank every time the shower runs, the toilet flushes, or the outside hose or sprinklers run. Free cooling energy is captured from the water supply and stored in the thermal battery prior to the water going through the home. This allows us to store free cooling potential for later use rather than wasting it as cold water runs down a drain or is spread across a lawn. The purpose of the holding tank is so that I can circulate water through the thermal battery even if there is no water flowing to my home. Without the holding tank, I would only have one chance to capture cooling energy from the water. With it, I can circulate the cold water in the tank through the thermal battery multiple times until all of the available cooling potential is extracted from the water. On the other side of the tank, liquid circulates through another copper coil and is sent to a cooling coil in the supply ductwork. Air is cooled as it passes through this coil, helping to cool the home with extremely minimal costs. The only associated cost is the tiny amount of power required by the two small pumps to circulate the fluid from the tank up through the cooling coil in the ductwork, and to circulate water from the holding tank through the coils in the thermal battery. The complete system incorporates a variety of control and automation components to assist with the general operation and real-time monitoring. DataNab temperature sensors are positioned throughout the system. 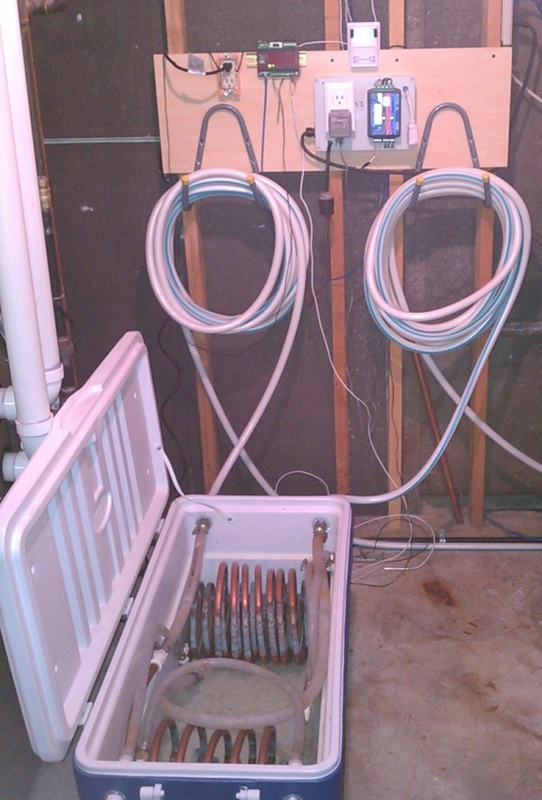 Two sensors measure primary incoming and outgoing water supply temperature. Using these sensors, along with an associated flow meter, we can determine how much energy is captured as the water moves through the tank and out to the home. Additional sensors note the temperature of the PCM material in the thermal battery, providing clarity on when the PCM material is fully frozen — and therefore fully charged. More sensors on the outbound side of the tank offer detail on water temperature as it moves through the air duct and exits at a warmer temperature. This provides insight into how much energy is transferred to the air circulating into the home. Sensors upstream and downstream of the cooling coil in the supply air duct, which displays how much the air is cooled as it is circulated through the home. A room temperature sensor and an outdoor air temperature sensor to help decide when the system should run. 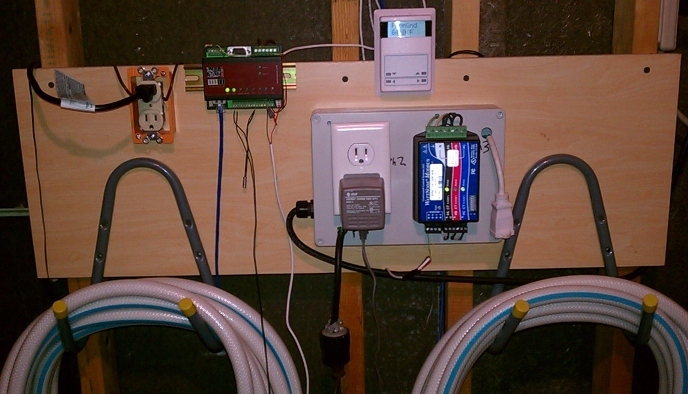 All of these sensors provide comparisons between various points, and determine how much the home has been cooled using the system. Most of the sensors are run direct to a DataNab MBus_Io10_LCD programmable controller, which has a built-in LCD screen and buttons to scroll through connected sensors, displaying water-in temperature, water-out temperature, tank water temperature, cooling coil temperature and so on. The various readings can automatically flash across the screen one at a time, providing a simple monitoring solution without the need for a computer. We can also change set points and modes from this interface to control when the system will run. A Barix Barionet controller picks up some additional sensors (the MBus_Io10_LCD supports eight external sensors) and talks to a WattNode demand meter, which provides data on electrical power demand and consumption used by the system. The Barionet can collect data from the WattNode and the other temp sensors and deliver it the LCD screen of the MBus_Io10_LCD for local monitoring purposes. Furthermore, the Barionet offers a built-in web server to display all of the associated data via a webpage — essentially IP-enabling the entire system. I can enable and disable the system via the web, and it delivers alarms via e-mail if the system isn’t functioning properly. The overall system costs are quite low. The insulated holding tank is just a re-used water heater tank, and the thermal battery tank is a store-bought cooler priced at $80. The off-the-shelf copper coils were priced at $20 apiece, and the small circulating pumps each cost around $50. The total cost of the sensors, the Barionet, and the MBus_Io10_LCD is under $350. The WattNode demand meter and the water meter are optional components and economically priced. The same design could be implemented in commercial settings, with the number and size of pumps and tank size to be determined by the cooling load and complexity of the facility. There are essentially two ways to charge the central thermal battery tank in a commercial application of this system. The first option is to tie the operation to an actual geothermal system. This would provide a dedicated process for circulating water underground for natural cooling, and then bringing it back through a coil in the tank to charge the phase change material. This could be an adequate solution to charge the tank, depending on the temperature of the ground loop and the cooling requirements of the building. A second option is to run AC compressor coils through the tank to charge/freeze the substance. Large commercial spaces may require that the tank temperature be as low as 45 degrees to properly cool the building during peak hours. This would require running compressors at night or during off-peak hours to fully charge the tank, when the exterior air is cooler, power is cheap, and the compressors don’t need to work quite as hard. The overall concept is to charge the tank at the most efficient possible times. The energy can then be stored inside the thermal battery for use during peak demand periods, keeping the facility safe from high demand penalties and saving the owner money. As energy continues to become more expensive, the savings associated with using power when it’s cheap and avoiding expensive demand penalties will make the initial cost of designing and installing a thermal storage system in commercial facilities worthwhile. In my home, if the thermal battery will enable me to run the air conditioner even 30 minutes less each day in the summer, it will provide significant savings in the long run. This is especially true considering the small amount of electrical power needed to power the system. The cost and energy-savings will certainly add up over time. Adam VanOort is the founder and owner of DataNabLLC and is responsible for company strategic vision, partnerships, and new product development. Adam has over ten years of experience in controls and building automation. Adam VanOort can be reached at avanoort@datanab.com.